Even before he underwent a hip replacement in December, Tom Rozier knew much more than the average person about joint surgery. Through his job in medical sales, he has worked with physicians in dozens of hospitals across Southeast Missouri. When it came time to plan his own surgery, Rozier, 46, sought treatment at Saint Francis Medical Center’s Center for Joint Replacement & Revision in Cape Girardeau instead of seeking care near his home in Crestwood/Sunset Hills outside St. Louis. Rozier first began experiencing pain five years ago — the result of both genetics and injuries he sustained in high school and college rugby and football. 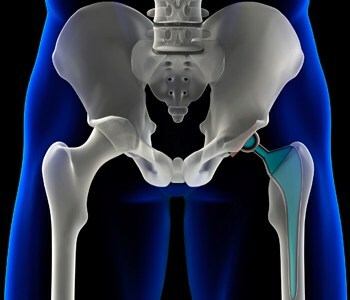 “The problem became progressively worse because I was wearing away the cartilage in my hip, which functions as the joint’s shock absorber,” he says. Finally, he saw R. August Ritter III, MD, orthopedic surgeon at Saint Francis, and scheduled a date for his surgery – December 18, 2014. Ritter offered a new, minimally invasive option for Rozier — the anterior approach. During the procedure, Ritter makes a small incision in the front (anterior) of the hip. With this anterior incision, he can reach the hip bone through the natural gap between the muscles and does not have to detach and reattach other leg muscles. This results in a shorter hospital stay and quicker recovery. Indeed, Rozier was home just one day after his surgery, and he was back at work seven days later.